Right to the point: there are two performances remaining, one tonight, and one on Tuesday, January 31st. You should go. At Symphony Hall last night the Boston Symphony Orchestra under the direction of Bramwell Tovey with three excellent soloists and John Oliver’s redoubtable Tanglewood Festival Chorus presented but one work — the 10-movement Lobgesang, or “Song of Praise” Op. 52 by Felix Mendelssohn. 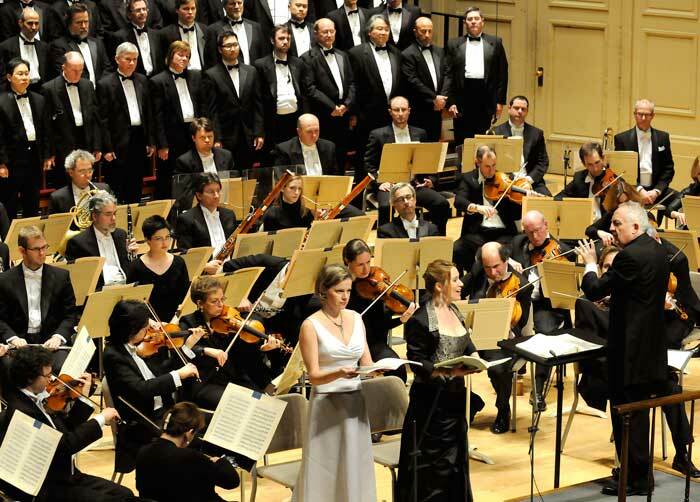 A more enriching experience at Symphony Hall would be hard to imagine. This concert was the second of six Friday evening events called “Underscore Fridays” by the orchestra, which begin at 7:00 PM and feature from-the-stage introductions from orchestra members, and end in time for a generous — and gratis — food and wine buffet for the entire audience and performers, so the two constituencies can meet and schmooze post-concert. This is part of the orchestra’s earnest outreach efforts to begin to break down the traditional barriers that normally exist between audience and performers and also help make BSO concerts more accessible to their audiences. The many enthusiastic participants last night indicated that this gesture was very well received. The orchestra’s experience with Mendelssohn’s remarkable score is limited. The BSO first played it while “on the road” in 1890 with its then-Music Director Arthur Nikisch, who had brought his orchestra to Old City Hall in Pittsburgh for a single performance on a Monday evening. In recent history, Seiji Ozawa conducted this music in subscription concert presentations in April of 1988. That’s all until this week’s revelatory concerts. Revelatory? Yes, indeed. In his charming pre-concert introduction from the stage, 21-seasons veteran violist Edward Gazouleas told the audience how the orchestra’s reacquintance with Lobgesang was akin to visiting one’s cellar and stumbling across a long-forgotten bottle of extraordinary wine. In looking at the bottle, one remembered the occasion of having received it, but the contents had remained untasted until it was now finally opened, savored, and immediately recognized as superb — a wonderful gift finally realized. And as fine wine is best enjoyed with appropriate vessels — fine crystal stemware, for instance — so too is music best appreciated when the vessel presenting it is of equal caliber to the notes printed on the page. The Boston Symphony Orchestra is certainly that vessel, and its many felicities of brass, woodwind, and strings — so aptly showcased in last week’s “conductorless” ensemble offerings — were united under the inspired leadership of Bramwell Tovey, a musician of impeccable taste. Tovey, whose experience is worldwide, was first seen at a BSO performance at Tanglewood last summer where he led a very highly regarded performance of George Gershwin’s Porgy and Bess in its composer’s intended grand opera version. When Riccardo Chailly unfortunately joined this season’s long list of cancelling conductors, Tovey was deputized to lead the concerts which Chailly had originally programmed. Frankly, it would be hard to imagine the absent Italian having had a greater success in presenting this remarkable music than Mr. Tovey’s, so strong and fluent was the latter’s leadership last night. He has fully internalized this wonderful score, and the forces on stage were “with him” for the span of the evening. The 31-year-old Felix Mendelssohn wrote his Lobgesang in June, 1840 for a Lepzig festival that celebrated the 400th anniversary of Gutenberg’s invention of moveable type and development of the printing press. Europeans felt then that this remarkable innovation, which, among many other possibilities allowed the words of the Lutheran Bible to be printed and then disseminated throughout the Christian world, was a symbol of German high-mindedness and worldly cultural enlightenment — erleuchten, “to cast light upon,” as the German text has it in a tenor aria. Such an invention at that time would have been equal in impact to the recent creation of the internet, suggested Maestro Tovey in his eloquent pre-concert talk. Lobgesang’s wonderfully inventive score calls for a full classical orchestra, plus organ (handsomely played by James David Christie in these performances) and three vocal soloists. Well matched in timbre and musicianship were the two sopranos, Carolyn Sampson and Camilla Tilling. John Tessier, stepping in for yet another last-minute cancellation, was the lyric-voiced and sweet-toned tenor. While of these three, the Swedish soprano Tilling projected the most authentic-sounding declamation of the German language; together they formed an earnest and fully competent trio. Mendelssohn’s music is constantly engaging, but in fact much more than that. It is inspired, moving, ceaselessly melodic and involving, and heart-touchingly beautiful. In addition to this, it inhabits a lofty spiritual and philosophical plane with its text, drawn from the scriptures yet also reflective of its metaphoric celebration of the cultural enlightenment mentioned above. Lobgesang is neither a true “symphony” nor an oratorio — on the title page of the urtext Mendelssohn called it Lobgesang. Eine Symphonie-Cantate nach Worten der heiligen Schrift. The inability of some listeners to “classify” this music is perhaps part of the reason for this score’s undeserved obscurity. Critics savaged it after its premiere, unfairly characterizing it as an unsuccessful attempt to imitate Beethoven’s ninth symphony. While Lobgesang surely does harbor several moments that may reflect homage to that earlier score, it is also surely no weak sister to the Beethoven. Lobgesang is fully capable of making its own salient points. There has been, in my opinion, too much bickering about this score over the years, even up to today, and not enough LISTENING. “Too much unending praise” is a major carp. Indeed, Maestro Tovey wittily brought this up before the music began. He characterized the score as “unrelievedly joyful,” and those coming to the concert looking for “unsupervised introspection” would not find it here. I say, more unrelievedly joyful music is just what this dreary world needs now and again, especially now. The performance was superb from beginning to end. Maestro Tovey conducted as a man eager to proselytize for this score, mining its subtleties, reveling in its exquisite successions of melodic invention, underscoring the music’s drama and illuminating its reverence. His equal partner in this, along with the BSO, was the full-throated Tanglewood Festival Chorus, shaping and savoring its every phrase, powerful and focused when demanded, quiet and prayerful when appropriate. Among many choral highlights were the strong projection of the powerful fugal entrances in movements VII and X and the dead-on intonation in the a cappella passages of the seven-voiced chorale Nun Danket alle Gott in movement VIII. The final entrance of the TFC men near the music’s conclusion, singing the music’s recurring trombone motive heard at the work’s very beginning and now reprised at its end, nearly caused me to jump out of my chair in gratitude for their rich, sonorous sound and sheer commitment to their text. Yes, Mr. Ehrlich, this concert should not be missed. Last night’s performance was thrilling in every way. concentrate on the many great pages of an unjustly neglected near masterwork. Let us hope that Maestro Tovey returns to the BSO often. The audience, only a bit more than half capacity, was quiet and raptly enthralled. The immediate standing ovation and enthusiastic bravos were prolonged. On the commute home I reflected on Mendelssohn in general and why this work gets such a bad rap- I suppose this has a lot to do with this modern idea that all concerts need to be made up only of masterpieces. I don’t think this work qualifies as a masterpiece- it’s certainly good, but not great music: by the time I got home I’d almost forgotten I’d even been to a concert. But it’s nice once in a while to go to a concert that doesn’t strive to make me see the world in a different way, or reevaluate the VERY NATURE OF MUSIC ITSELF, etc. There should be a place in concert life for good “lighter” music like this. I was there last Thursday, and the tune for “Alles, was Odem hat, lobe den Herrn,” is still popping into my mind from time to time. “Lobgesang” was definitely worth programming. “Lobgesang” is worth programming, every 5 or 6 years. But to say that it is a masterpiece is definitely abusing words. What kind of words would the reviewer use after a Beethoven concert? masterpiece of masterpiece? It just shows bad taste. Mr. Zhu – de gustibus non est disputandum!